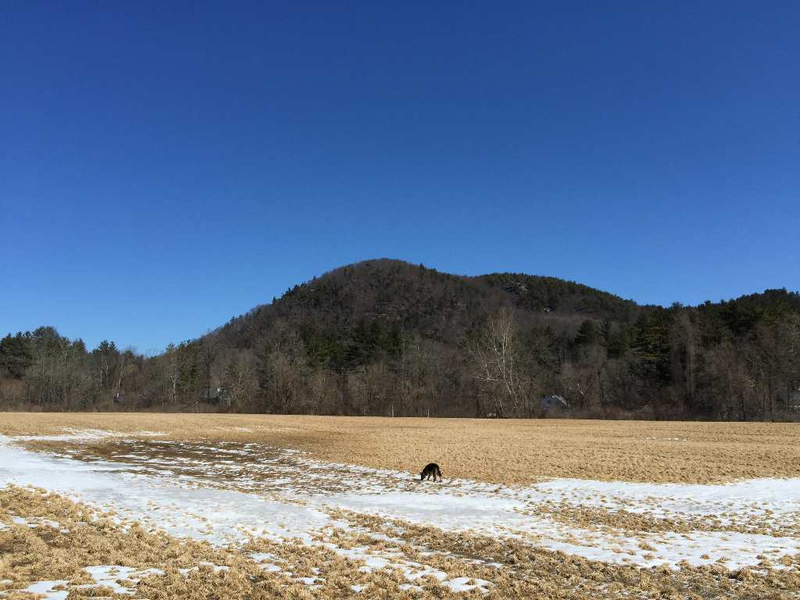 Sycamore Field is a Salisbury Association Land Trust ownership in the southern Berkshires. 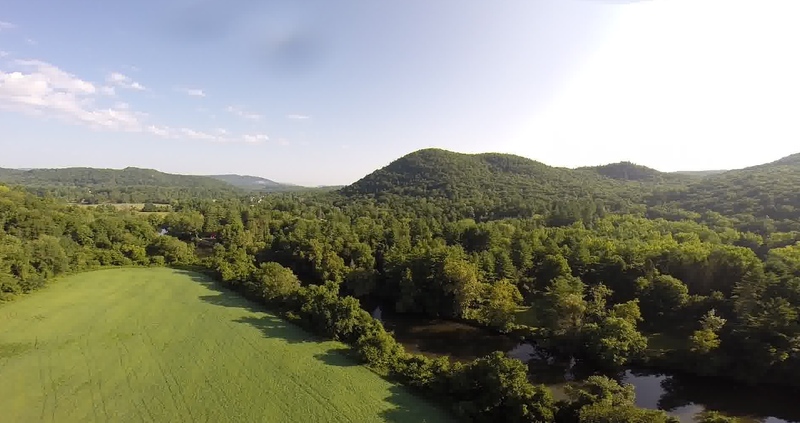 It is located in Lime Rock on the Housatonic River, about a mile east of the famous Lime Rock Park race track. The preserve is 38 acres in extent with about 28 acres of open field and a half-mile of river frontage. Over half of the field is in the 100-year floodplain of the Housatonic. Elevation is 545′ ASL. All of the soils are either USDA Prime Farmland Soil or USDA Statewide Important Farmland Soil. The field is leased for hay production to a farmer affiliated with the Cabot dairy co-op. The preserve is quite photogenic and it also provides a great base from which to image the greater landscape. 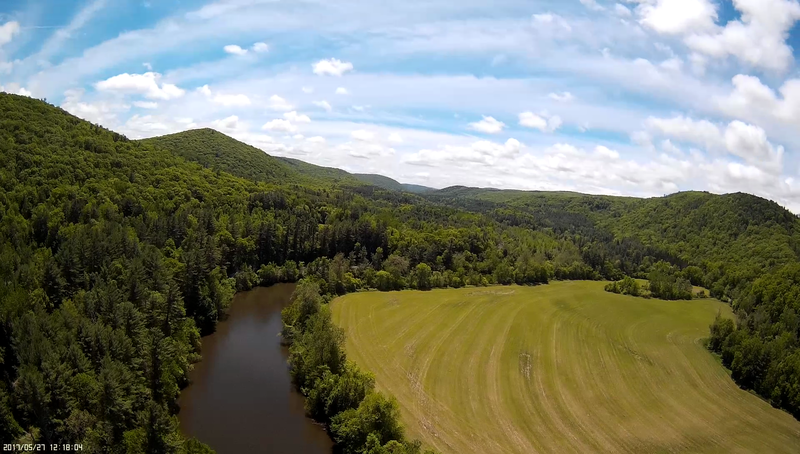 I try to do test flights of target preserves and landscapes before I fly for the final shots. This is usually accomplished with a FPV model airplane with long-distance radio and video links. I’ll do some multi-rotor drone work, too, and then use both products to plan the main mission that typically gets uploaded to the DJI Inspire 1 V2 with the X3 camera. Sycamore Field Preserve in the middle distance. This approach is from the south and the river is flowing toward the camera. Barrack Mountain at right, Sharon Mountain at left. 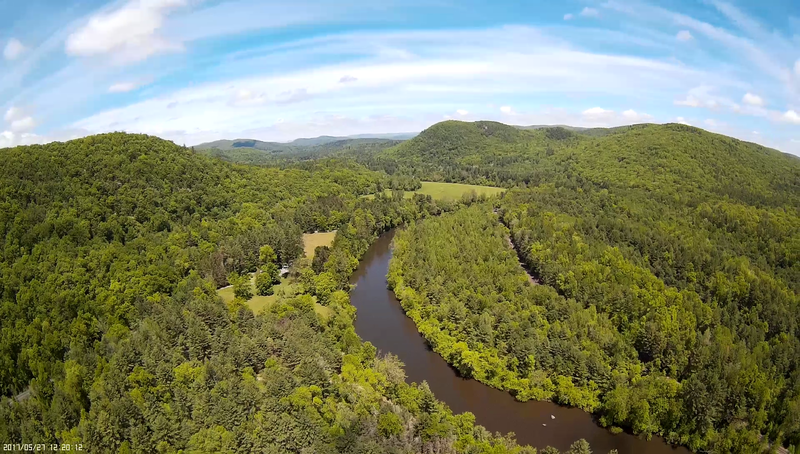 This is the start of what I call the canyon portion of the Housatonic, where it transitions from a relatively low-gradient, flatwater, wandering river to swiftwater and thence to rapids at the covered bridge in West Cornwall. Aircraft: Mini-Talon FPV airplane, Eagle Tree Vector flight computer, Mobius camera, video captured image. Approach from the southeast. 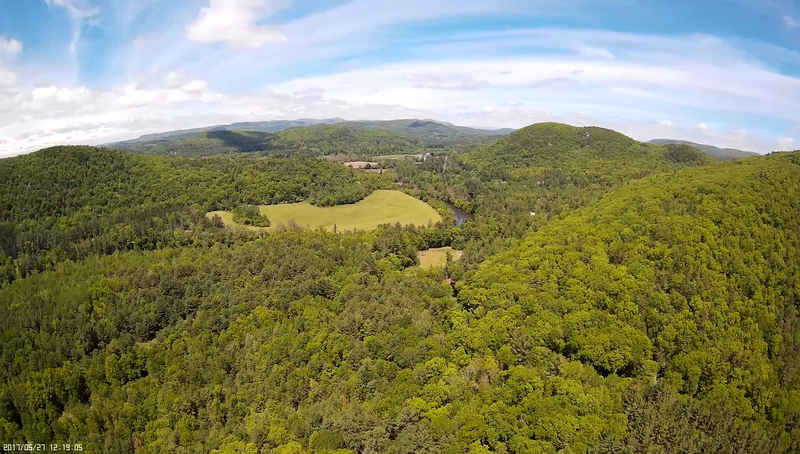 Dean’s Ravine right foreground, Sycamore Field farm preserve at center, Barrack Mountain to the right of the preserve and river, Sharon Mountain left center, Prospect Mountain middle distance, Riga to Everett on left skyline. 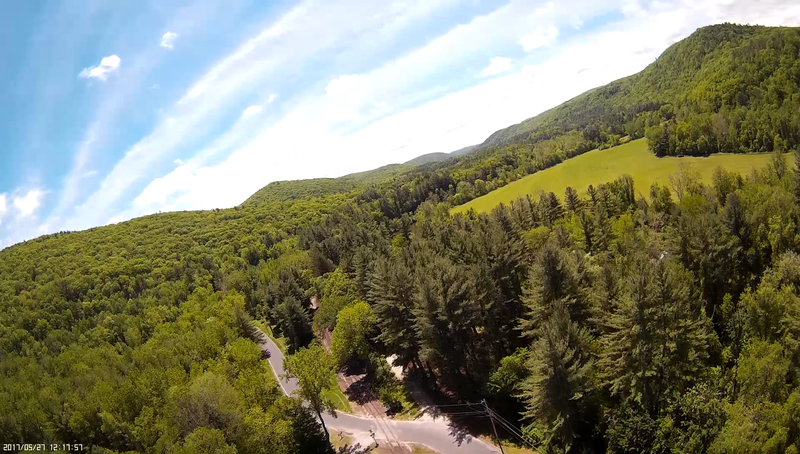 This image captures the core uplands of the Berkshires. This is a very fast (~80 knots) and low (~200′ AGL) downwind leg to the NNE of the Sycamore Field preserve. Aircraft: Mini-Talon FPV airplane, Eagle Tree Vector flight computer, Mobius camera, video-captured image. 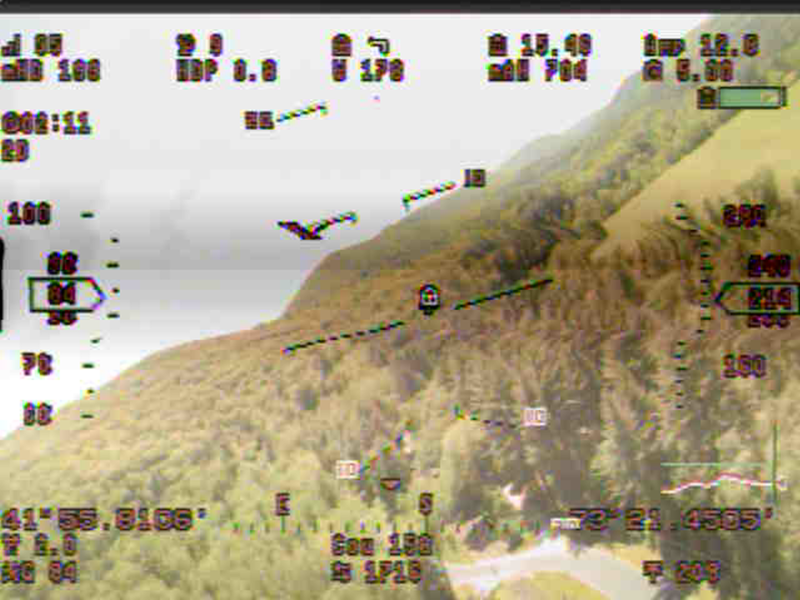 This is the pilot’s view in the FPV (first person view) display simultaneous with the previous photograph. This is an image from the comparatively low-resolution flight camera that operates independently from the imaging camera. Altitude is displayed in the center-right box (214′ AGL), airspeed in the center-left box (84 knots) … this was a power descent that’s not typical flying. The Mini-Talon is a workhorse aircraft that is remarkably stable and wicked fast. Typical cruise speed is about 35-40 knots. It has the shape of a military drone, somewhat short and stocky with stubby wings. Compact but heavily laden with electronics and a 6600mAh 4S LiPo battery, it needs an approach speed of about 25 knots or it starts to fly like a brick. This is one of the final photographs, unmodified, that I liked for the preserve. Altitude is about 300′ AGL, a height that nicely captures the preserve’s landscape setting. Aircraft: DJI Mavic, Litchi flight management software, video-captured image.